What did you do to your VFR Today? Pulled by bike out of storage and loaded on Uhaul trailer for the 800+ trip from Kansas City to Atlanta. Now just need to get it tagged here. Looking forward to the interesting Atlanta traffic on the bike! With the advancement/price reduction in 3D printers, has anyone printed out a solution? Suggestions for GPS recovery device? 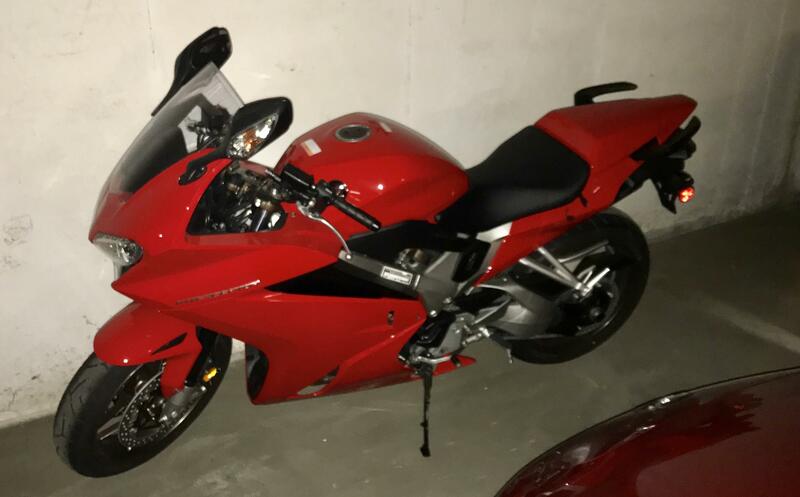 I am looking for recommendations for a GPS recovery device for my 2014 VFR. Living in Atlanta losing my bike to theft is a unfortunate possibility. I have seen many different GPS devices, some battery operated and some hardwired in. Also some have as much as $25/monthly fee, and that is probably more than I would like to spend. How does using one of these theft recovery devices help with insurance costs? I bought my bike from this dealer in north east Iowa and hauled it back to Kansas City. I got it home on the back of a rented full-size pickup truck. Loading was easy at the dealership and for unloading I stopped at my local bike repair shop and they let me use their ramp for unloading. I might try that again if I don’t want to wait until it warms up. The fun part will be arranging air travel and coordinating that with a good weather weekend. Thanks for all the suggestions. I think I am going to wait a couple months and just fly up and ride the bike down. Maybe March or so. I can go either through St Louis or down south route so I should be able to avoid too many heavy showers. I’m sure 2 400mile days should not be too much trouble, if I make many stops. I usually park my bike once it gets below 40 degrees because I haven’t invested in a good seat of cold weather gear, yet.